Habitat: Sage is native to the Mediterranean region. It usually grows on hillsides and grassland. 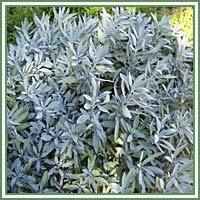 Description: Sage is a small, perennial, evergreen shrub. It has a strong taproot and woody, wiry stems. Its leaves are oblong to lanceolate, finely toothed and hairy, gray-green in color. Flowers are in whorls, violet-blue. Medicinal use: Sage is considered to be antihydrotic, antiseptic, antispasmodic, astringent, carminative, cholagogue, galactofuge, stimulant, tonic and vasodilator. It has a history of medicinal uses, and was considered to be, as its name suggests, “the savior” (salvia), or the healer, a great remedy to promote longevity and wellbeing. Sage is most commonly used in treatment of respiratory problems: infections, cough, cold and sore throat. It is recommended as an appetite and uterine stimulant. Tea is very beneficial in cases of nervous complaints, problems with digestion, liver and kidney disorders. Strong infusion could act as a lotion against ulcers and raw abrasion on the skin. 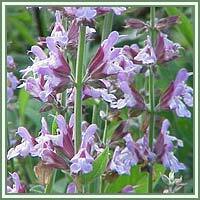 Safety: Being a powerful uterine stimulant, Sage should be avoided during pregnancy, and also during lactation. Some herbs could react with certain medication. Therefore, it is highly advisable to consult your doctor before consumption of any herb.